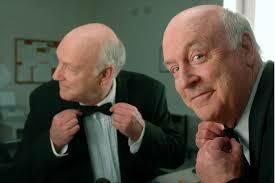 The Varnished Culture is suspicious of most New Zealand products, but John Clarke (29 July 1948 to 9 April 2017) was very much an exception. We passed Higson Lane in Melbourne only a few days ago and thought of him, photographed with perennial off-sider Brian Dawe in front of the neon Go-Go sign (see main image). He originally came to prominence as Fred Dagg, who gave a rambling discourse about some arcane matter before leaping on a bus to god knew where. He combined a keen sense of human idiocy with hard-won, in-depth knowledge that he originally acquired on coming to Australia by closeting himself with stacks of newspapers for weeks on end. His little pieces of political satire (with Dawe) missed the mark on occasion but were usually deadly accurate. Clarke saw no reason to impersonate his targets physically, instead skewering them by simply talking the kind of hogwash they did, usually coming to a deadly, circular stop. (We liked the episode on Frontline where executive producer Brian Thompson pitched them a spot where they’d be made-up to look like their victims – their underwhelmed reactions are priceless). For us, his high points were background work on The Gillies Report, the sometimes po-faced Olympic farce The Games, his supporting role in the film Death in Brunswick and of course, his creative and writing credit on that legendary, sublime ABC television series, The Fast Lane.